Our nephew Brendan was kind enough to stick around for a few days after Thanksgiving to give us another hand on Matilda. We continued our stripping of the body. While Brendan used the angle-grinder to wire wheel the old, crusty remains of the weather stripping, I cut the rubber seal and removed the windshield. I also began dismantling the driver's door. Overall, the car is nearly rust free (especially compared to the car parked next to it), but there are a few small spots under the back seat, in each door sill, and inside the window slot in each door. With brushes in hand, Brendan and I applied Rust Mort to any spot that needed it, and a few that didn't for good measure. According to the instructions, some rust must remain to react with the rust converter, which would explain why some spots seem to have been treated better than others. I also took this time to remove the fenders, hood, and head light bezels. I plan to remove the remaining items from the engine compartment when next I have time, in order to get ready for paint. Before returning Brendan home, we made a trip to Harbor Freight so I could do my part to support the US trade deficit by purchasing some of the finest tools China has to offer (at rock bottom prices!) I picked up various items, including an air regulator/drier and two new gravity-feed spray guns. I'm confident that with such surgical grade instruments, and my finely honed body and paint skills Matilda will end up with a paint job that Earl Scheib himself would be proud of. I started tearing down the engine today, and with the exception of a few minor obstacles (a broken valve cover bolt, and the strange presence of a wood screw) it went pretty well. Even though the only other engine I've ever rebuilt was roughly the same size (a Briggs and Stratton lawnmower powerhouse in a tenth grade small gas engines class) this one is slightly more complex and has a four-speed manual transmission built into it. So, armed with this intimidating knowledge, I've been bagging and tagging all parts and pieces and taking pictures like a paparazzi stalking Brittany Spears. I'll need to start up Chad's solvent tank parts washer and get the thirty-six years of grease off of this stuff, but I'm leaning toward getting the engine compartment and interior of the body ready for paint. We learned an important lesson last Sunday afternoon: choosing to pick up a spirited, mud-encrusted Simone can result in a lower back injury. Gary was flat on his back in a great deal of pain for several hours after the attempted lift, and then had to spend the next 24 hours lying down alternating heat and cold packs before he made a full recovery. Staying home sick from work when one is immobilized isn't generally fun, but Gary made the best of it. While sequestered to the recliner in the living room, he spent time online researching a few things for the Matilda project. He decided to begin by searching for tires. He called the Schwab's store in Corvallis that he used to work for to see if he could get a set of 145/80-10 tires for Matilda, but they don't carry anything that small. Not to be discouraged, he turned to the Internet. 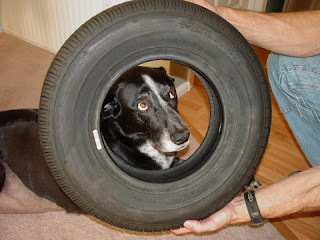 Several Google searches later, he found a Mini Cooper parts company based in Auburn, CA that carried the tires for a fair price and ordered them. They arrived Thursday. They are so small that all five of them fit in one relatively small box! Matilda's new tires aren't much bigger than Simone's head! When I arrived home from class late Monday afternoon, Gary was feeling better and a little stir crazy from being cooped up all day. We decided to then go out and see if we couldn't find paint for Matilda. We've been looking hard at purple cars lately, and I'd decided the only purple I really liked was one found on late 1990s Dodge vehicles. I couldn't find a paint name or color code though, so we thought we'd try the auto paint store and see if we could identify it by looking through their color chart books. We drove out to Tangent and spent the next 15 minutes looking at paint chips. None of them seemed correct. The man that was helping us suggested we go to the Dodge dealership and see if they had one on the lot or could help us identify the color. We managed to find the dealership in Albany, but they didn't have any purple vehicles, and didn't have any pictures of one. They suggested we visit another dealership to see if they might have any on the lot. Gary called Chad to see if he had any ideas, and in less than two minutes, he had both the name and the color code for the purple that I liked: Deep Amethyst Pearl (TCU). Chad saved the day yet again! So, we headed back to the auto paint store and bought some of the paint supplies that we will need. 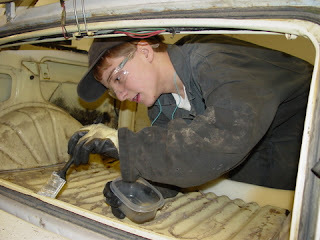 We're hoping to paint the engine compartment and the inside of the car over the Thanksgiving holiday. We painted some on a plastic coverplate to see how it would look. 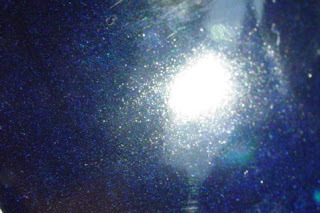 It's a little hard to see with the glare, but it's a deep purpley-blue. I can't wait until our project is far enough along to where we will be able to paint the exterior body! 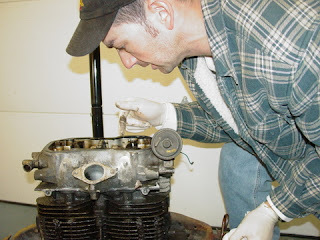 In the meantime though, Gary continues to tear down the engine and work on tracking down things like engine gasket and seals. Hopefully we'll be blogging again soon about the engine disassembly.